This is a phone with me having iced tea with milk an hour after I landed in Singapore. I had to go straight to the hospital for my check-up, but since we had about 30 minutes before my appointment we decided to have a snack. The snack turned out to be some yummy Korean beef and then I grabbed some iced tea with milk from the "drinks stall" for just SG$1.30. 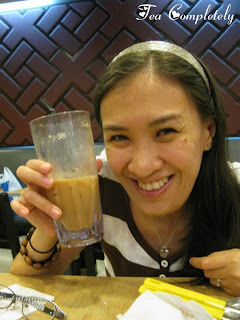 One of the things I love about Singapore is the fact that you can get iced tea with milk anywhere and everywhere! Most hawkers center drinks stall sell tea with milk (except for the one on Victoria Street near Bras Basah Road, hmph!). I remember when Drew and I were on our way to Jurong Bird Park we actually got some at the bus station. (Yeah we are addicted to it!). I was half-way through the drink when my husband finally got my attention for a photo-opt. Yumyumyum!